Sandavágur is a city on the south coast of the Faroese island of Vágar, and has been voted the most well-kept village in the Faroes twice. And it's the most famous city in the country, and best voted traveling experience. The name Sandavágur means sandy bay and refers to the sandy beach which used to be much larger than present. From one point in Sandavágur you can get a view of all the southern islands in the Faroes. 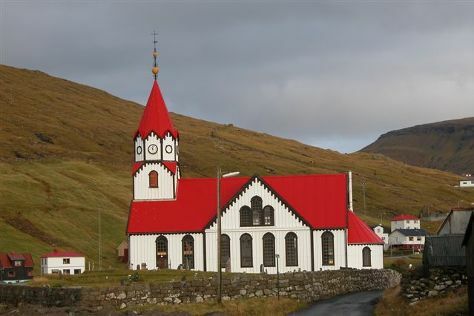 Sandavágur used to be a municipality until 1 January 2009, when it fused together with the neighbour village Miðvágur into the new Vágar municipality.Data:HistoryThe town has an ancient history. A 13th century runestone, discovered in 1917, bears an inscription stating that the Norwegian Viking Torkil Onundarson from Rogaland was the first settler in this area. The stone can be seen in Sandavágur Church. Excavations in the town have also uncovered ruins from the Middle Ages.Á Steig in Sandavágur was the residence of the Lagman, the lawspeaker and leader of the Faroese parliament, until 1816, when the office was abolished and the islands became a Danish administrative district. The clergyman V. U. Hammershaimb, who was born in Sandavágur in 1819 and became the father of the Faroese written language, was the son of the last law speaker.There is a freestanding rock to the east of the town called Trøllkonufingur, which means Witch’s finger. It is said to have been climbed only once, and the story goes like this: "Frederick VII of Denmark visited the Faroe Islands in 1844, and a man climbed the Witch’s finger so that he could wave to the King as he sailed past. Later, when the man had come down, he realized that he had left one of his gloves on the top of the rock, so decided to climb it again. On his way to the top he fell and died." Sandavagur is in Vagar Island. Take a look at our Faroe Islands trip planner to refine the details of your trip to Sandavagur.